This morning, I tweeted that I picked up The Kills new single "Satellite." Then I opened up my e mail and see info on said single and the upcoming album it's from. So, lovely readers of mine, feast your eyes on the deets below. 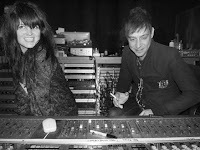 Jamie Hince and Alison Mosshart, better known as The Kills have released their new single "Satellite." Check out the stream below using the handy widget. "Satellite" is the first song from the bands upcoming album Blood Pressures. Fans will be able to get their happy little hands on Blood Pressures, April 5. You can pre-order the album on the band's website.